You love all of the rustic options we have in Austin, but cannot fathom an outdoor summer wedding? 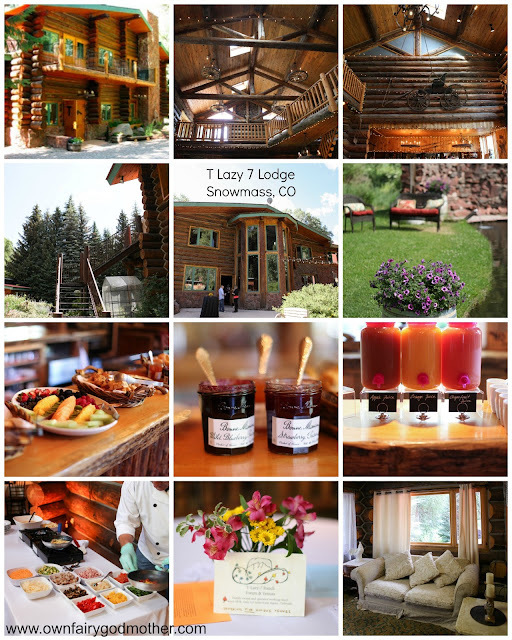 T Lazy 7 near Snowmass and 3 miles from Aspen may be your answer! It's a family owned and operated working ranch. They do provide alcohol, bartenders, tables, and chairs. You get to bring in your own planner, caterer, florist, linens, band, etc. 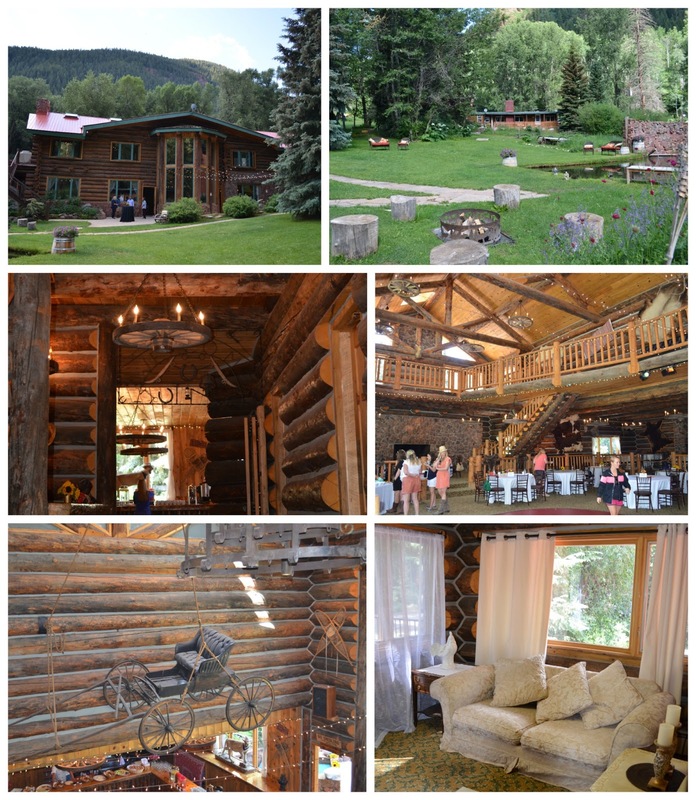 They have a rustic lodge complete with wagon wheel chandeliers, a suspended wagon, a bridal ready room with a balcony, and lush grounds with a stream, small bridge, pond, and a fire pit. There is a concrete patio and large lush lawn surrounded by trees. You can seat up to 200 guests, and tables and chivari chairs are included. You still need a wedding planner, linens, florist, dj/band, and caterer, but that's what Your Very Own Fairy Godmother is for! The tasty breakfast spread and omelet stations that you see catered below is by Conundrum Catering. If you're looking for something even more unique in regards to rustic charm, the Chuckwagon Grounds may catch your eye. It can seat 100+ guests and has a "Chuckwagon Saloon" for the bar with wagon wheel chandeliers, and several adorable wagons around the perimeter of the space, a river, natural beaver ponds, and even horseshoe pits. This would be a great relaxed rehearsal dinner space or casual wedding reception site. THE MEADOW: The above picture does NOT do this site justice. It's absolutely stunning. (Even Style Me Pretty thought so.) The Meadow is lined with Aspen trees and in the foreground of the magnificent 14,018 foot Pyramid Peak which punctuates the end of Maroon Creek Valley. 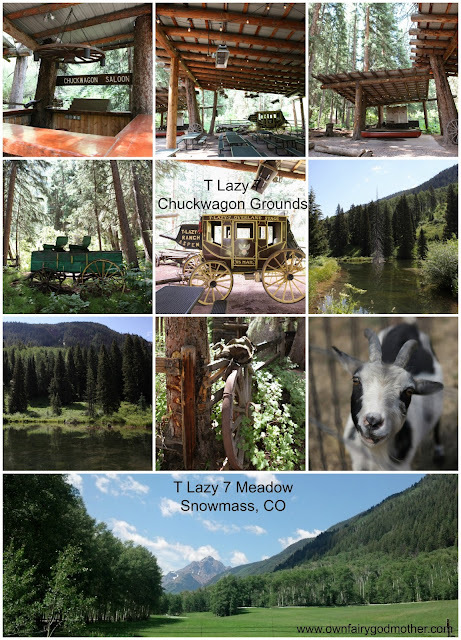 The meadow has enough space to accommodate almost ANY guest list. You can easily have a ceremony, cocktail, and reception space without shuttling guests from one location to another. It offers close parking for easy access and simple setup. When you rent the meadow, it is yours for the entire day, so let your imagination run wild (or bring in a team to help create a vision unique to you) for your picture-perfect day.